Think Hawaii is all about sun and sand, sipping Mai Tai's and Hula Dancers in grass skirts? Well, think again! Want to vacation on a luxurious paradise island but don't have a passport? No worries! Visit Hawaii! Hawaii is full of surprises. Which means there's more to these paradise islands than crystal blue waters and black sand beaches. And if you wander a bit off the beaten path, you'll come face to face with a few unexpected favorites like local food and the welcoming culture of aloha. In Hawaii, you will experience rich culture, breathtaking lush surroundings and lots of delicious authentic island cuisine. I recently returned from completing the O'ahu Master Specialist Training in Hawaii. I had the pleasure of spending nine incredible days on the beautiful island of O'ahu and every single moment, even being knee deep in mud was a remarkably experience. As a Certified Travel Consultant and Hawaii Destination Specialist, I have clients with various interest and who have different travel needs and I wanted to experience all aspects of the island in order to personally recommend the perfect hotel, attraction or restaurant that offers just what my client needs. Once I arrived at Daniel K. Inouye International Airport I was greeted with a warm welcome by my personal transportation for the week, the incredible Dustin, Owner of Executive Chauffeur. Executive Chauffeur Hawaii provides luxury transportation for any event in O'ahu. Our driver was absolutely phenomenal. Dustin, a local of O'ahu was so down to earth. He played awesome music and even throw in a couple of fun facts as he drove us around the island. 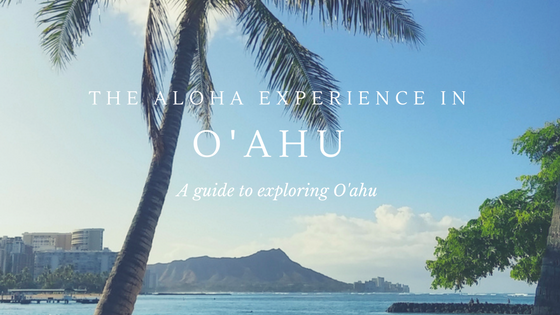 Take a look at some of my suggestions on how to get the most out of your holiday in Hawaii based on my first head experience exploring this paradise island. And when you're ready to head to Hawaii on your next travel adventure, let me help plan your custom itinerary. Hyatt Centric Waikīkī Beach is a great place to enjoy a delicious dinner and a live performance by local talent such as Taimane. The Hyatt Centric Waikiki Beach offers 230 guestrooms and suites, on-site dining, a pool, and beachfront access in Waikiki on Honolulu. This new property offers a modern feel and is designed with the savvy traveler in mind. Enjoy a bright and refreshing room with floor-to-ceiling window views, contemporary décor, and luxurious features. Not to mention the beautiful pool with private cabanas and gorgeous views. Laylow, Autograph Collection: The Laylow Hotel is a Vintage Retro hotel with mid-century modern deco. Enjoy free shave ice daily from 1-2pm, and complementary Ukalalee lessons on week days during happy hour, plus you can take a dip in the heated, salt water pool. I enjoyed the Laylow's refreshing vibe and central location. The sand floored, fire pit area with amazing views overlooking all the hot spots of Waikiki was definitely a bonus. Prince Waikīkī Hotel: One of my favorite hotels, partly because of the spectacular unabstructed views of the Pacific Ocean and Harbor, combined with a magnificent infinity edge pool. The Prince offers newly renovated rooms, delicious cuisine and the lobby is practically an art gallery filled with creative architecture from local artist. The guest rooms are specious and feature modern decor including hand-painted Nai‘o flowers on the walls of each room. One of my favorite features was the floor-to-ceiling windows that open with expansive ocean views, inviting a refreshing ocean breeze into the entire room. Surfjack Hotel & Swim Club: Enjoy the Infamous “most Instagrammed Hotel pool" in Hawaii. The Surfjack is where metro meets modern. The hotel is decked out with mid-century modern inspired decor and offers a unique feel of historic Waikiki. They even play throwback Elvis movies in the evenings by the pool. The Modern Honolulu: Is called the "Best Boutique Hotel in Hawaii" for a reason. The Modern Honolulu is a sleek and trendy luxury boutique hotel with breathtaking harbor views. Enjoy a handcrafted cocktail in the Study, an exquisite bite to eat at the Ravish resturant and dance all night at the on site night club Addition. Sheraton Waikīkī: The Sheraton is a classic ocean front Hawaiian resort. The hotel has several restaurants on site and an infinity pool with phenomenal ocean views. The Royal Hawaiian Hotel, A Luxury Collection: Located right on Waikiki Beach, The Royal Hawaiian hotel also known as the pink palace offers the best of traditional luxury accommodations and modern welcome. The entire build offers a warm yet historic feel filled with classic art decor. Moana Surfrider, A Westin Resort & Spa: This unique balance of timeless Victorian elegance and modern Hawaiian charm is located right on Waikiki Beach boasting with breathtaking views of the Pacific Ocean. Bishop Museum was founded in 1889 by Charles Reed Bishop in honor of his late wife, Princess Bernice Pauahi Bishop, the last descendant of the royal Kamehameha family. The Museum was established to house the extensive collection of Hawaiian objects and royal family heirlooms of the Princess, and has expanded to include millions of objects, documents and photographs about Hawaii and other Pacific island cultures. The museum has expanded to include a Planetarium, Science Adventure Center and so much more! It was amazing to learn about the authentic Hawaiian history and culture while viewing ancient artifacts of the Polynesian Islands and hearing the life stories from our magnificent local tour guide who was extremely passionate about this rich history. Be sure to visit the newly renovated Hawaiian and Pacific Halls. The Polynesian Cultural Center offers a melting pot of island culture with recurring dinner and live entertainment such as, “Hā, the Breath of Life”. The Polynesian Cultural Center is a unique treasure created to share with the world the cultures, diversity and spirit of the nations of Polynesia. PCC has concentrated this spirit in a beautiful North Shore setting and consequently become world-renowned as a special place of enchantment, entertainment and education. Haleʻiwa Store Lots. Located in the heart of Hale‘iwa, the plantation-inspired Hale‘iwa Store Lots is an open-air retail center that reinforces the area’s unique and historic charm. Hale'iwa has tons of shops and restaurants that are unique and memorable in their own way. Each individual store is either locally-owned or has roots in the North Shore community. Matsumoto Shave Ice. Indulge in the famous refreshing Shave Ice from this long time family owned business. While scooping up the yummy, colorful bowl of shave ice, I learned all about "Uncle Stanley", the owner of Matsumoto Shave Ice share. He gladly shared with me the long history of how his father opened a grocery store, M. Matsumoto Store Inc. in 1951 and the long standing history of how they make their homemade syrup in house. Be prepared to stand in line. Matsumoto HSave Ice is a popular staple on the island. The Street, A Michael Mina Social House – International Market: Dinner at The Street is a true culinary journey of different cuisines from a bowl of ramen to a slice of Chicago style pizza. Can't decide between a burger and ribs? Choose both. This fancy food court style dining offers many delicious entree options from notable chefs from all over the world, live savory music and an electric vibe. International Smoke owner, Ayesha Curry, wife of famous NBA Super Star Stephen Curry, whips up a mean mac & cheese. The Kansas Style BBQ ribs were finger licking good. SALT at Our Kakaʻako: Named after the pa‘akai (‘Ōlelo Hawai‘i for “salt”) ponds that once dotted the low-lying wetlands of this area, SALT at Our Kaka‘ako is Honolulu’s epicenter for local culture, food, shopping and innovative events. Comprising of 85,000 square-feet of curated retail, restaurant and mixed-use space, SALT is a dynamic city block designed for exploration and engagement. After strolling through the marketplace of local, handcrafted retails, I explored many of the restaurants in the food mecca. Ravish @ The Modern Honolulu: Let your taste buds explode from the flavors that you'll experience at Ravish. Located in The Modern Hotel, Ravish is a hip and modern restaurant offering an incredible vibe. Banán Bowls: Bananas represent the heart of Banán, and EVERY banana they use is grown in Hawaii, along with many of their other fruits, veggies, and spices. However, to excite taste buds from all walks of life sometimes they use ingredients that can't be grown or found on the islands. They believe in full transparency and will always indicate on their menu which ingredients are locally sourced. By being a little flexible, they intend to please and inspire the lives of more people, leading to better business for local farmers, and ultimately leading towards building a stronger and more sustainable Hawaii. Mahina & Sun’s: Enjoy delicious island cuisine and hand crafted cocktails in a funky atmosphere. Leonard's Bakery: Satisfy your sweet tooth with a pink box of goodness packed with scrumptious Hawaiian style Malasadas. Enjoying a Delicious and refreshing BanAn Bowl chiling on waikiki beach. Papahana Kuaola: Get down and dirty, literally at Papahana Kuaola, located in the ahupuaʻa of Heʻeia in the ʻili (smaller section of land) of Waipao, is a mālama ʻāina (care for the land) based learning organization that is connecting the area's past with a sustainable future. In this hands-on learning opportunity, I explored the Hawaiian concept of ‘ahupua‘a: Land division usually extending from the uplands to the sea in the outdoor classroom. The ‘ahupuaʻa is the finest example of sustainability. Nick, our group leader gave us a tour of the region, explain their mission to create quality learning focused on Hawaii's cultural and natural resources, environmental restoration, and economic sustainability fully integrated with Hawaiian knowledge in order to exemplify a lifestyle respectful of kānaka, ʻāina, and akua. Our hands-on work day focused on restoring the beauty and spirit of Waipao for future generations. Being submerged knee deep in mud, with tadpoles and some other unidentified creature swimming around my legs, I pulled weeds and stomped unruly grass into the muddy waters to prepare the soil for the planting of Kalo (taro). Taro is the staple of the Native Hawaiian diet and at the core of the Hawaiian culture. Hawaiians believe the taro plant to be sacred. Taro, also called “kalo” in Hawaiian, is central to the Native Hawaiian creation story. This powerful, enlightening, and spiritual experience was completely eye opening. To learn how ancient practices of community and sustainability are still being practiced today is uplifting on many levels. The philosophy of taking care of each other is felt through the island. Paepae o Heʻeia: Located about 10 minutes way, Paepae o He'eia is a private non-profit organization dedicated to caring for He'eia Fishpond – an ancient Hawaiian fishpond located in Heʻeia, Koʻolaupoko, Oʻahu. Established by young Hawaiians in 2001, Paepae o He'eia works to build and maintain a thriving and abundant He'eia Fishpond for the community. Keli’i Kotubetey, Founder and Assistant Executive Director explained the rich history behind the purpose of fishponds and how they are created and maintained. Kualoa Ranch & Private Nature Reserve: Kualoa is a 4,000-acre private nature reserve and working cattle ranch, as well as a popular tourist attraction and filming location on the windward coast of Oʻahu. Only a quick ferry across to Secret Island for lunch followed by some sun and fun activities. I took my first attempt at the stand up paddle board-#FAIL and even tried the Kayaking, thinking that would be easier..#MajorFAIL. I completely freaked out and panicked, fearing that I would fall off and cut my feet on the corral reef below as soon as I got on the paddle board. Kualoa Ranch is well known for being the filming locations for blockbuster films such as Jurassic Park and Jumanji. Naked Cow Dairy: A dairy farm located on the west side of Oʻahu offers hands on cheese-making workshops. In business since, 2007 with the idea of bringing back the small family dairy of the past, going back to natural treatments for their cows, going back to when cows had names not numbers, back to before antibiotics and hormones were considered “normal cow treatments.” Unable to compete with mainland milk production, they began to create gourmet butters and artisan cheeses to add value to their milk. Naked Cow means “natural” the way nature intended. There fully committed staff love their cows and it shows in their products! They follow the organic guidelines for the treatment of their cows, and don’t use antibiotics or hormones. They are committed to producing milk and other dairy products naturally. I enjoyed a butter tasting of a "spread" (pun intended) of delicious butters. My favorites were the garlic and herb and the sea salt. Kahumana Organic Farm & Café: I enjoyed a taste lunch in a pleasant farm environment. The menu highlights produce grown just steps away from your table, wild-caught fish brought in by local fishermen, and responsibly farmed local meats. Followed by a tour of the Retreats at Kahumana, specializing in yoga and wellness retreats, school groups and overnight farm stays, perfect for corporate team building. Waikīkī Beach Services: Take surf lessons with the skilled instructed at Waikiki Beach Services, fronting the Royal Hawaiian Hotel. Waikīkī Beach Services has been the premiere destination for surfing in Waikiki since it began operations in 1955. Waikīkī Beach Services offers daily surf and SUP lessons, outrigger canoe rides, and catamaran charter sails with our staff of licensed Waikīkī Beach Boys. Waikīkī Beach Services also rents surfboards and stand up paddle-boards by the hour, with two convenient locations right on the beach in Waikīkī. Surfing was definitely one of the highlights of my trip. I had NO idea hoe physically challenging it is to surf. But now I can honestly say that I've surfed in Waikiki, the capital of surfing. Pearl Harbor: Tour the USS Missouri. On September 2, 1945, in Tokyo Bay aboard the USS Missouri, representatives of the Allied and Axis powers met in solemn ceremony to “conclude an agreement by which peace can be restored”. Following General Douglas MacArthur’s introductory speech, representatives of the Empire of Japan were directed to step forward and sign the two copies of the Instrument of Surrender. General MacArthur then signed on behalf of all the Allied powers followed by representatives of Allied nations in attendance. General MacArthur concluded the ceremony by saying: “Let us pray that peace be now restored to the world, and that God will preserve it always. These proceeding are closed!” With those words, World War II was over. Due to security reasons, NO purses, backpacks, fanny packs, diaper bags, camera bags, luggage or other items that provide concealment are allowed in the Visitor Center. Wallets must fit in pockets or be carried. Exploring Hawaii was an amazing experience. I loved seeing all of the beauties around the island. Are you ready to visit O'ahu or one of the other Hawaiian Islands? Contact me to get started planning your remarkable experience.